We live in a sweet little mid-century ranch (hence our little living room in need of a little coffee table – see previous post). Every holiday season since we moved in, I have silently cursed the tiny space between our front and storm doors. 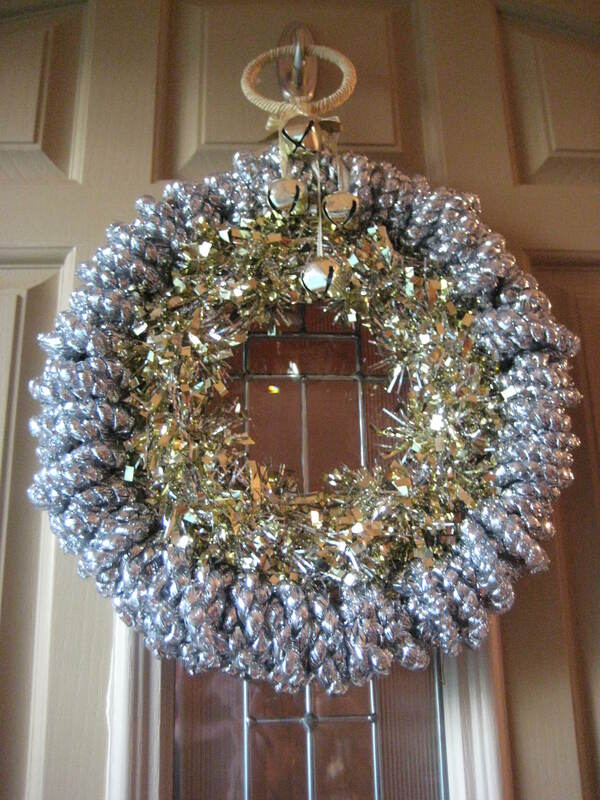 Hang a normal sized wreath and it’s subjected to a good crushing whenever the door is closed. Unacceptable! Being a thrifty girl, I occasionally find myself at the Dollar Store. During a recent trip, I was inspired to create a wreath that a) would be the right size, b) wouldn’t cost me an arm and a leg and c) I’d be willing to hang on my front door for all the world to see. Using a twist tie, fasten the outer circle of the 7″ wreath to the inner circle of the 11″ wreath so that the smaller wreath nests inside the larger wreath with equal space between the two. Using a twist tie, fasten the bottoms of the wreaths as in Step 1. Once fastened to the larger wreath, the smaller wreath can be pivoted to make room needed for Step 3. Wrap the 11″ wreath with four strands of tinsel – one strand for each quarter of the wreath, knotting each strand together and tucking in unsightly strands as needed. Continue wrapping until the 11″ wreath is completely covered. Pivot the tinsel wreath back into place. Secure with additional twist ties on the sides (optional). Using the loop at the top of the tinsel wreath, hang from 3M hook. Hang the bell doorknob hanger on the 3M hook to finish the look. It took me about 20 minutes and I’m pretty pleased with the result!